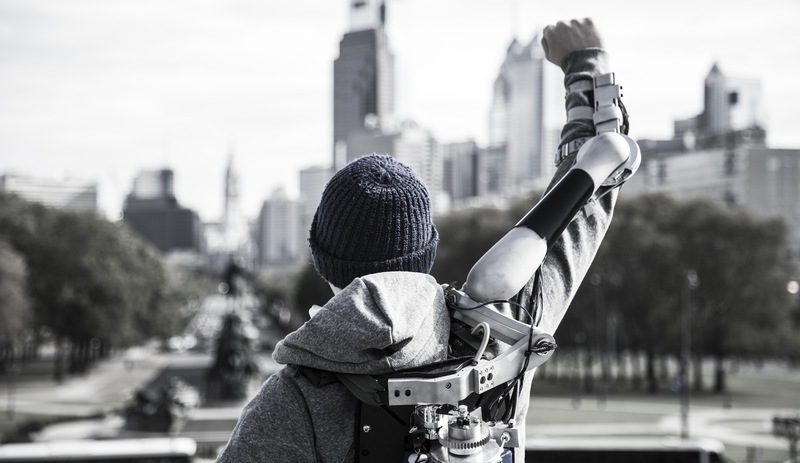 With numerous prototypes in development, it seems like just a matter of time before the industrial robotic exoskeleton becomes an everyday reality. Between NASA, the US armed forces, Panasonic, and now Daewoo, the range of powered robot suits seems virtually limitless. And Daewoo, the South-Korean manufacturing giant, now appears to be a step ahead of the competition, having already tested its prototype suits last year. The test took place at a sprawling shipyard in Okpo-dong in South Korea, where workers dressed in wearable robotics were hefting large hunks of metal, pipes and other objects. 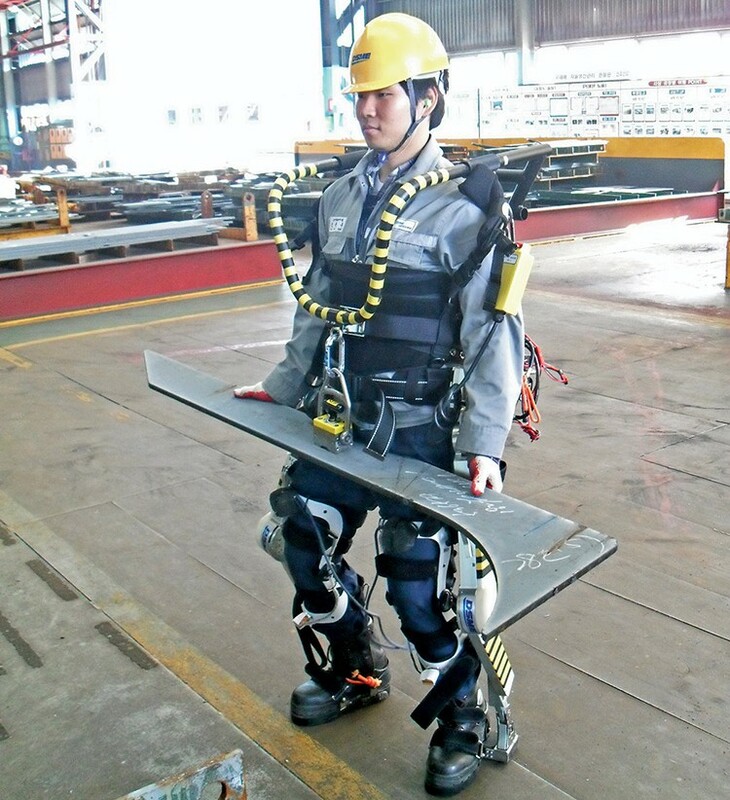 It was all part of a test by Daewoo’s Shipbuilding and Marine Engineering facility, where workers strapped into 28kg (62 pound) aluminum alloy, steel and carbon fiber suits called the RoboShipbuilder that supported their own weight plus an additional 30kg (66 pounds). Anyone between 160 and 185cm tall (5 feet 2 inches and 6 feet) fits the suit, and it has three hours of battery life. Straps across the legs, feet and chest secure the wearer, and the RoboShipbuilder runs on hydraulic joints and electric motors, with the power source tucked inside a backpack. And, because the suit bears most of the weight of the heavy objects, wearers have much finer control over what they are handling. 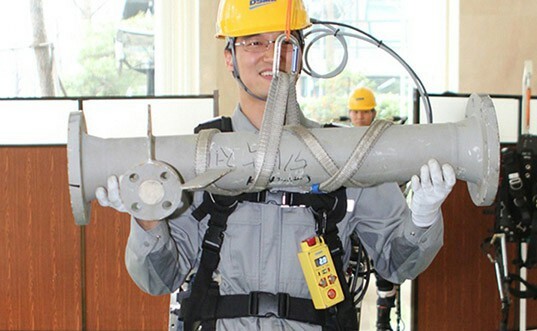 Gilwhoan Chu, the lead engineer for the firm’s research and development arm, says the pilot showed that the exoskeleton does help workers perform their tasks. Worker feedback was mostly positive, but their were comments that the suit could be faster and be bale to carry more weight. Chu and his team are working towards this, hoping to increase the robot’s lift capacity to 100 kilograms (220 pounds). The prototypes still have several important kinks to be worked out as well. In tests, workers had a hard time negotiating sloping or slippery surfaces. And the prototypes cannot yet cope with twisting motions, so workers making turns while carrying heavy objects could tire out easily. But South Korea’s vast shipbuilding market is committed to merging human oversight with automation, and Daewoo is hardly alone in working towards this goal. 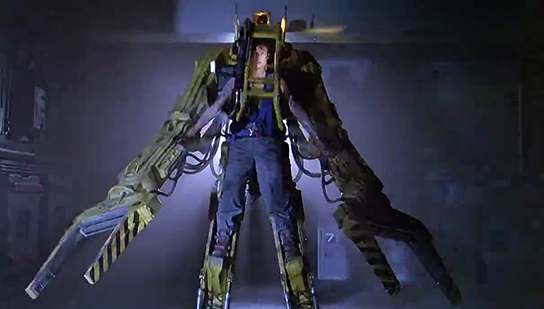 Earlier this year, the Panasonic subsidiary Activelink is developing an exosuit known as the Powered Loader – a deliberate homage to the Caterpillar P-5000 Powered Work Loader from Aliens fame. According to Activelink, the Power Loader will enable a human to lift up to 100 kilos (220 pounds) and run at speeds up to 8 kilometers (5 miles) per hour, and will be powered by lithium ion battery packs that will provide several hours worth of power. The exoskeleton will initially be deployed in construction work, nuclear power plants, and emergency situations, but the company has big plans for the future. Activelink would like to develop an exosuit that can fit under a spacesuit or diving gear for underwater and space exploration purposes. The Power Loader appears to be a full-body version of creations like the battery-powered robotic Titan Arm, which won the 2013 James Dyson Award. The Titan Arm augments arm strength by 18 kg (40 pounds), helping rehabilitate people with back injuries and assisting those lifting objects as part of their daily work. The price for Panasonic’s strength suit is currently projected to be 500,000 yen (around $4,940), and Panasonic says it wants to bring the suits to market by next year. It’s an exciting time to be alive, where a once-feverish dream of science fiction fanatics is fast becoming reality! I was having a flashback to Aliens while reading this.